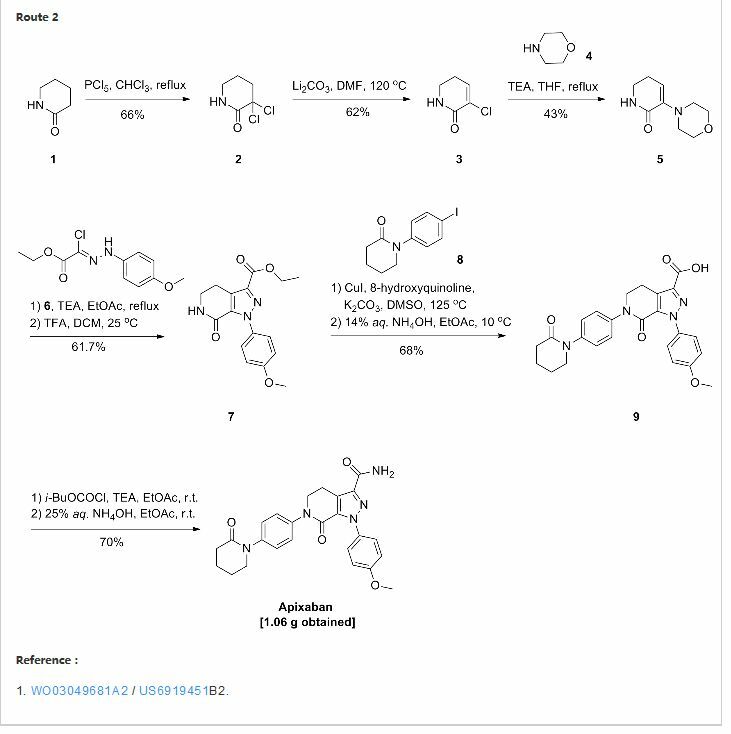 ND-2110 is a potent and selective experimental inhibitor of IRAK4 described in patent WO2013106535  and in a poster presented at the American College of Rheumatology meeting in 2012 (Abstract #1062 in Supplement: Abstracts of the American College of Rheumatology & Association of Rheumatology Health Professionals, Annual Scientific Meeting, November 9-4, 2012 Washington DC, Volume 64, Issue S10, Page S1-S1216). 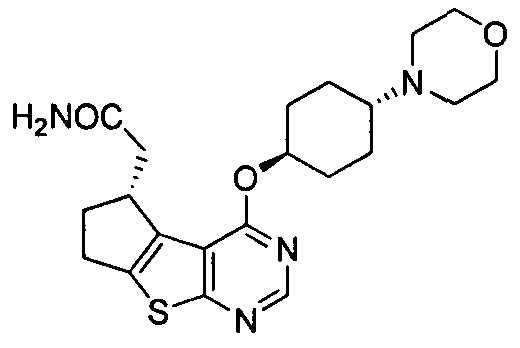 Synthesis of compound 29.1. 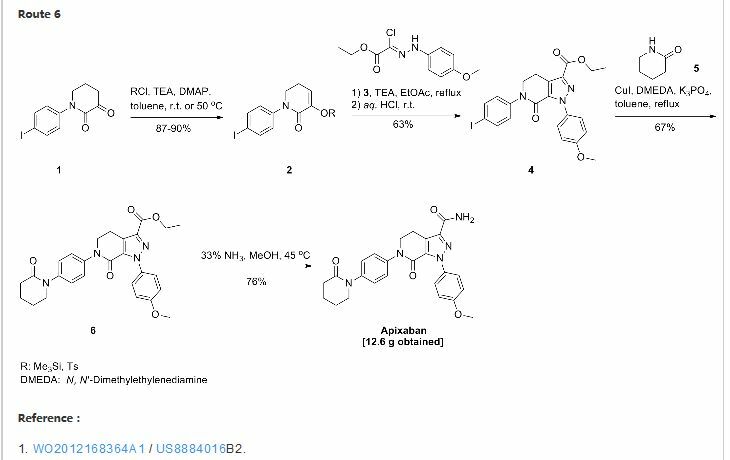 4-(Morpholin-4-yl)cyclohexan-l-ol (commercially available; 218 mg, 1.2 mmol, 1.50 equiv) was treated with NaH (60% dispersion in mineral oil, 128 mg, 3.2 mmol, 4 equiv) in freshly distilled tetrahydrofuran (15 mL) for 30 min at 0 °C in a water/ice bath under nitrogen. Then a solution of intermediate 25.1 (289 mg, 0.8 mmol, 1.00 equiv) in 5 mL of THF was added via syringe and the resulting solution was allowed to stir for an additional 3 h at 60 °C in an oil bath. The reaction was then quenched with saturated aqueous NH4CI and extracted with 3 x 50 mL of ethyl acetate. The combined organic layers were washed with brine, dried (Na2S04) and concentrated under vacuum. The residue was applied onto a silica gel column with ethyl acetate/petroleum ether (1:5-1:2) and purified to afford compound 29.1 (260 mg, 63%) as a colorless oil. Synthesis of compound 29.2. To a solution of 29.1 (260 mg, 0.5 mmol, 1.0 equiv) in 10 mL of DCM was added 0.5 mL of concentrated hydrochloric acid in an ice/water bath. The resulting solution was stirred for 2 h and concentrated in vacuo. The residue was neutralized with saturated aqueous Na2C03 and extracted with 3 x 50 mL of ethyl acetate. The organic layers were combined, washed with brine, dried (Na2S04) and concentrated under reduced pressure. The residue was purified by column chromatography on silica gel with DCM MeOH (15:1) to afford the desired alcohol 29.2 (185 mg, 91%) as a colorless oil. Synthesis of compound 29.3. Alcohol 29.2 (185 mg, 0.46 mmol, 1.00 equiv) was oxidized with dipyridinium dichromate (752 mg, 2.00 mmol, 4.36 equiv) in 50 mL of DMF for 24 h at room temperature. The resulting solution was diluted with water and extracted with 3 x 50 mL of mixed solutions of CHC¾/iso-PrOH. The organic layers were combined, dried (Na2S04) and concentrated under vacuum. The residue was applied onto a silica gel column with dichloromethane/methanol (5:1 to 1:1) and purified to afford 105 mg (55%) of acid 29.3 as a yellow oil. Synthesis of Compound 1-67. A 50 mL round-bottom flask containing a solution of acid 29.3 (105 mg, 0.25 mmol, 1.00 equiv), NH4C1 (80 mg, 1.50 mmol, 6.00 equiv), EDCI (57 mg, 0.3 mmol, 1.2 equiv), 4-dimethylaminopyridine (37 mg, 0.3 mmol, 1.2 equiv) and HOBt (40 mg, 0.3 mmol, 1.2 equiv) in 5 mL of anhydrous DMF was stirred for 24 h at room temperature. The resulting solution was diluted with water and extracted with 4 x 50 mL of mixed solution of CHCl3:iso-PrOH. The combined organic layers were concentrated under vacuum. The crude product was purified by preparative HPLC (SHIMADZU) under the following conditions: column: SunFire Prep C18, 19*150mm 5um; mobile phase: water (0.05% NH4CO3) and CH3CN (6.0% CH3CN up to 50.0% in 25 min); UV detection at 254/220 nm. 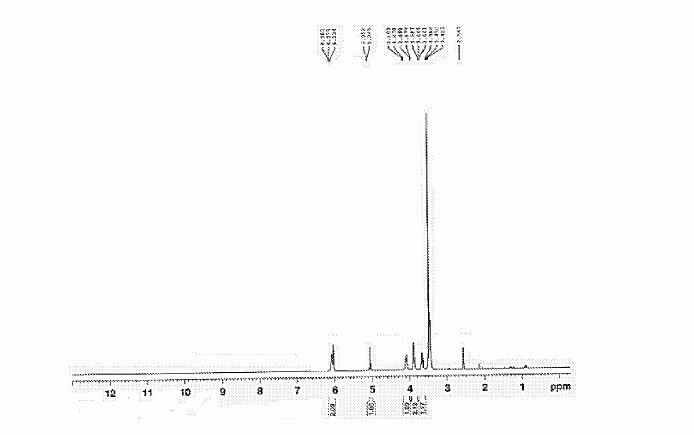 The product-containing fractions were collected and concentrated to give Compound 1-67 (22.5 mg) as a white solid. 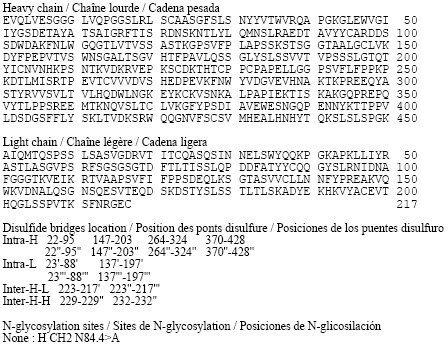 ¾ NMR (300 MHz, CD3OD) δ 8.43 (s, 1H), 5.27-5.20 (m, 1H), 3.80-3.70 (m, 5H), 3.29-3.27 (m, 1H), 3.12-2.90 (m, 2H), 2.73-2.67 (m, 5H), 2.49-2.42 (m, 1H), 2.32-2.19 (m, 4H), 2.10-2.06 (d, 2H), 1.67-1.46 (m, 4H). MS: m/z 417 (M+H)+. Example 29: Synthesis of 2-((R)-4-(((lr,4R)-4-morpholinocyclohexyl)oxy)-6,7- dihydro-5H-cyclopenta[4,5]thieno[2,3-d]pyrimidin-5-yl)acetamide. Synthesis of compound 31b. 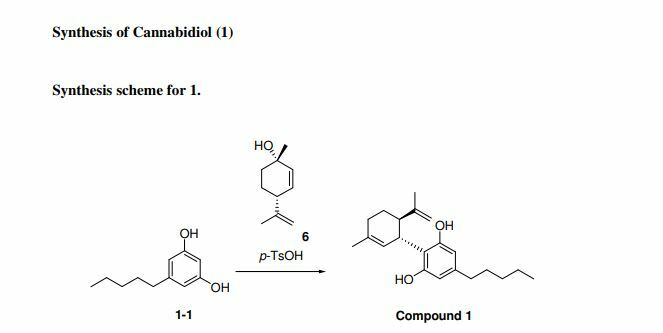 4-(Morpholin-4-yl)cyclohexan-l-ol (commercially available; 218 mg, 1.2 mmol, 1.50 equiv) was treated with NaH NMR (60% dispersion in mineral oil, 128 mg, 3.2 mmol, 4 equiv) in freshly distilled tetrahydrofuran (15 mL) for 30 min at 0 °C in a water/ice bath under nitrogen. Then a solution of intermediate Hb (289 mg, 0.8 mmol, 1.00 equiv) in 5 mL of THF was added via syringe and the resulting solution was allowed to stir for an additional 3 h at 60 °C in an oil bath. The reaction was then quenched with saturated aqueous NH4CI and extracted with 3 x 50 mL of ethyl acetate. The combined organic layers were washed with brine, dried (Na2S04) and concentrated under vacuum. The residue was applied onto a silica gel column with ethyl acetate/petroleum ether (1 :5-1 :2) and purified to afford compound 31b (260 mg, 63%) as a colorless oil. Synthesis of compound 32b. To a solution of 31b (260 mg, 0.5 mmol, 1.0 equiv) in 10 mL of DCM was added 0.5 mL of concentrated hydrochloric acid in an ice/water bath. The resulting solution was stirred for 2 h and concentrated in vacuo. The residue was neutralized with saturated aqueous Na2C( j and extracted with 3 x 50 mL of ethyl acetate. The organic layers were combined, washed with brine, dried (Na2S04) and concentrated under reduced pressure. The residue was purified by column chromatography on silica gel with DCM/MeOH NMR ( 15: 1 ) to afford the desired alcohol 32b ( 185 mg, 91 %) as a colorless oil. 2009184-0008 24 h at room temperature. The resulting solution was diluted with water and extracted with 3 x 50 mL of mixed solutions of CHCU/iso-PrOH. The organic layers were combined, dried (Na2S04) and concentrated under vacuum. The residue was applied onto a silica gel column with dichloromethane/methanol (5: 1 to 1 : 1 ) and purified to afford 105 mg (55%) of acid 33b as a yellow oil. Synthesis of Compound. A 50 mL round-bottom flask containing a solution of acid 33b (105 mg, 0.25 mmol, 1.00 equiv), NH4C1 (80 mg, 1.50 mmol, 6.00 equiv), EDCI (57 mg, 0.3 mmol, 1.2 equiv), 4-dimethylaminopyridine (37 mg, 0.3 mmol, 1.2 equiv) and HOBt (40 mg, 0.3 mmol, 1.2 equiv) in 5 mL of anhydrous DMF was stirred for 24 h at room temperature. The resulting solution was diluted with water and extracted with 4 x 50 mL of mixed solution of CHCI3: iso-PrOH. The combined organic layers were concentrated under vacuum. The crude product was purified by preparative HPLC (SHIMADZU) under the following conditions: column: SunFire Prep C I 8, 19* 150mm 5um; mobile phase: water (0.05% Ν¾∞3) and CH3CN (6.0% CH3CN up to 50.0% in 25 min); UV detection at 254/220 nm. The product containing fractions were collected and concentrated to give the product (22.5 mg) as a white solid. Ή MR (300 MHz, CD3OD) δ 8.43 (s, 1H), 5.27-5.20 (m, 1H), 3.80-3.70 (m, 5H), 3.29-3.27 (m, 1 H), 3.12-2.90 (m, 2H), 2.73-2.67 (m, 5H), 2.49-2.42 (m, 1H), 2.32-2.19 (m, 4H), 2.10-2.06 (d, 2H), 1.67- 1.46 (m, 4H). MS: m/z 417 (M+H)+. IRAK4, a serine/threonine kinase, plays a key role in both inflammation and oncology diseases. 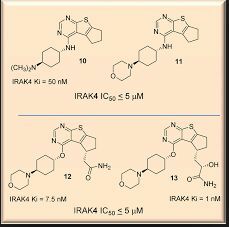 Herein, we summarize the compelling biology surrounding the IRAK4 signaling node in disease, review key structural features of IRAK4 including selectivity challenges, and describe efforts to discover clinically viable IRAK4 inhibitors. Finally, a view of knowledge gained and remaining challenges is provided. 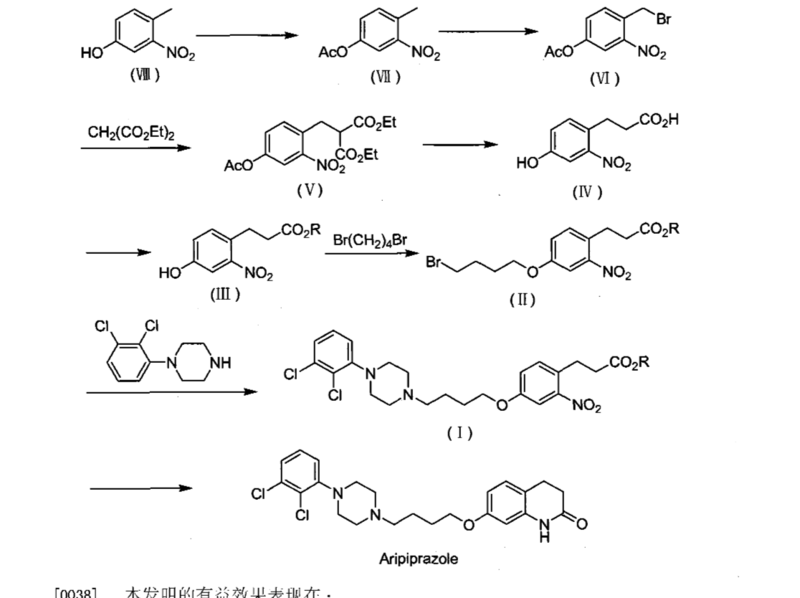 78 Romero, D. L.; Robinson, S.; Wessel, M. D.; Greenwood, J. R. IRAK Inhibitors and Uses Thereof. WO201401902, January 16, 2014. Harriman, G. C.; Romero, D. L.; Masse, C. E.; Robinson, S.; Wessel, M. D.; Greenwood, J. R. IRAK Inhibitors and Uses Thereof. WO2014011911A2, January 16, 2014. 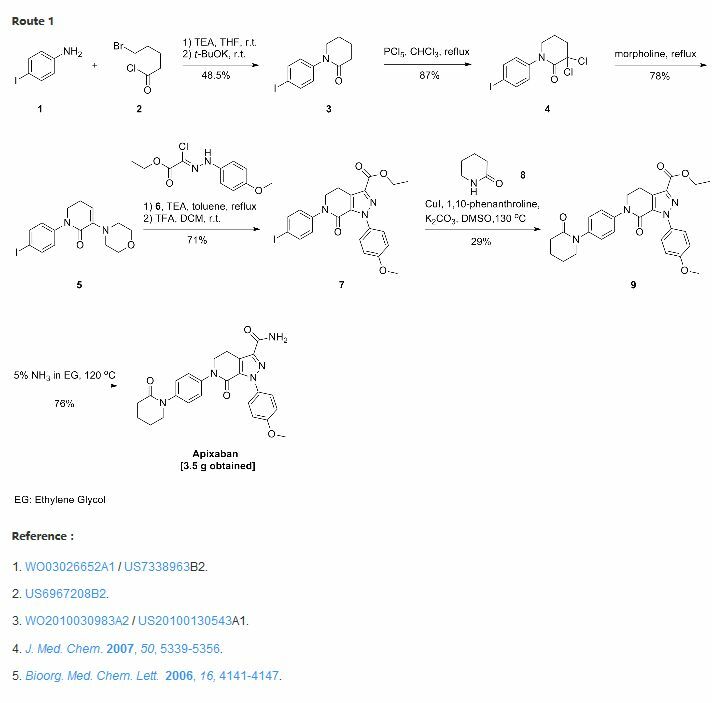 Recent Advances in the Discovery of Small Molecule Inhibitors of Interleukin-1 Receptor-Associated Kinase 4 (IRAK4) as a Therapeutic Target for Inflammation and Oncology Disorders. J. Med. Chem., 58 (1): 96-110. Irak inhibitors and uses thereof. Patent number: WO2013106535C1CC(CCC1N2CCOCC2)OC3=C4C5=C(CCC5CC(=O)N)SC4=NC=N3. Assignee: Nimbus Iris, Inc.. Priority date: 18/07/2013. Publication date: 10/01/2012. By DR ANTHONY MELVIN CRASTO Ph.D in Uncategorized on April 11, 2016 .